A coal miner's granddaughter, TESS COLLINS was born and raised in a crater. Yes, really, a crater formed by the impact of an asteroid millions of years ago where her hometown, Middlesboro, Kentucky was eventually built. Tess spent her younger years in a one room Carnegie Library reading around the room. She started at BLUEBERRIES FOR SAL and ended with WAR AND PEACE at which time she thought, "I want to do this." She is the author of THE LAW OF REVENGE, THE LAW OF THE DEAD, THE LAW OF BETRAYAL, HELEN OF TROY, NOTOWN, THE HUNTER OF HERTHA and SHADOW MOUNTAIN. Her non-fiction book HOW THEATER MANAGERS MANAGE is published by Rowman and Littlefield's Scarecrow Press. Ms. Collins received a B.A. from the University of Kentucky and a Ph.D. from The Union Institute and University. 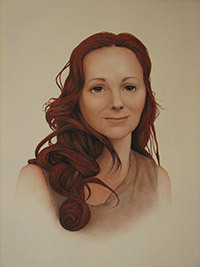 Portrait by Appalachian artist Bill Sturdivant.